Editor’s Note: Chad Bernstein, a Miami Fellows Class X alum and co-founder of Guitars Over Guns, is the 2019 Ruth Shack Leadership Award honoree. It also provided him the opportunity to attend the college of his dreams – the University of Miami Frost School of Music, where he went on to receive his master’s degree and doctorate. Music has taken him all over the world since then, playing and recording with top artists like Pharrell, The Temptations and Pitbull. Moreover, music has allowed him to connect with other people and his community. In Miami, that manifested in an opportunity to co-author the sound of the city with his two bands Suénalo and the Spam Allstars. Chad and his bandmates visited a juvenile detention center to talk about starting a career in music as a favor to a friend. As they talked, the kids eyes started to glaze over, he said. It wasn’t until the band started playing that the kids tuned in and started listening. 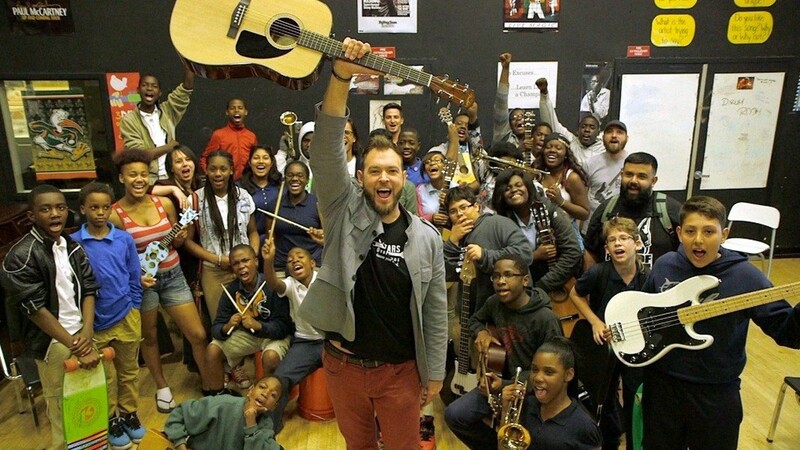 This moment and his experience with the impact music had on his life led Chad to formalize the ad-hoc music mentoring project they’d started into the Miami-based nonprofit Guitars Over Guns in 2008. Today, the organization provides music instruction and mentorship to students in Miami and Chicago. Over the past 10 years, they’ve reached more than 3,000 students. Supported by our Community Grants program, Guitars Over Guns pairs mentors – all of whom are working musicians – with schools to help the students find their voice. Of those students, 99% graduated on time and more than 90% reported improved decision-making skills and self-esteem. “The best part about our program is watching these kids transform,” Chad told us. Guitars Over Guns mentors students like Junior Pierre. Junior grew up without a father and frequently came close to failing out of school. A teacher encouraged him to join Guitars Over Guns. Junior’s grades and behavior improved. He graduated and received scholarship offers to prestigious music schools. He credits Chad as his mentor: “Chad has seen something in me that I probably would have never seen. Guitars Over Guns has shaped my future desires and what I want to get accomplished,” Junior noted. Listen in as three Guitars Over Guns students share their stories. Today, Junior is living his dream as a musician playing bass guitar and is one of six Guitars Over Guns alumni working as mentors in the organization. He’s also a voting member on the organization’s board. For his exceptional leadership and dedication, The Miami Foundation will recognize Chad with the 2019 Ruth Shack Leadership Award at the annual Civic Leadership breakfast on April 16th. Each year, the Ruth Shack Leadership Award honors an individual age 40 or under who reflects the qualities embodied by the Foundation’s President Emeritus, Ruth Shack: a passionate champion for Greater Miami, steadfast ethics, unselfish service and a connector of our diverse community. Ana Mantica is editorial officer for The Miami Foundation. Great work Dr. Chad! Yet another well deserved recognition. Please keep up the great work! Way to go Chad!! Well deserved award. Sky is the limit. Super excited for Chad and his team. Guitars Over Guns has made an impact in the lives of our young people. This award is well deserving. Congratulations.! Congratulations Chad! You’re doing beautiful work. Chad is a great musician that also gives back to our community. Congratulations for a well deserved recognition! Congratulations Chad, you are doing a grateful work!!! Congrats Chad! Keep up the great work! Chad, Congratulations! So well deserved! Congratulations and thank you for taking a vision and making it a reality for the benefit of so many! Rock on, Chad! You are a person who really walks the talk. Refreshing. Congratulations, Chad. You are an inspiration to so many ! Well deserved honor . Congratulations, Chad. Chad, you are an inspiration to all of us. . I am proud of you! Well done! Congratulations!